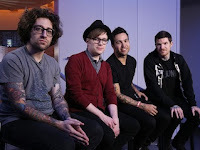 Fall Out Boy and Ed Sheeran are amongst confirmed for the TODAY Show's Summer Concert Series at Rockefeller Plaza. You can check out the entire concert lineup for the summer below. Fans and visitors are encouraged to come to the plaza for the live performances. Viewing is on a first-come, first-served basis outside TODAY's window-on-the-world studio, located at 49th Street and Rockefeller Plaza in New York City. Fans should arrive by 6 a.m. for best viewing.